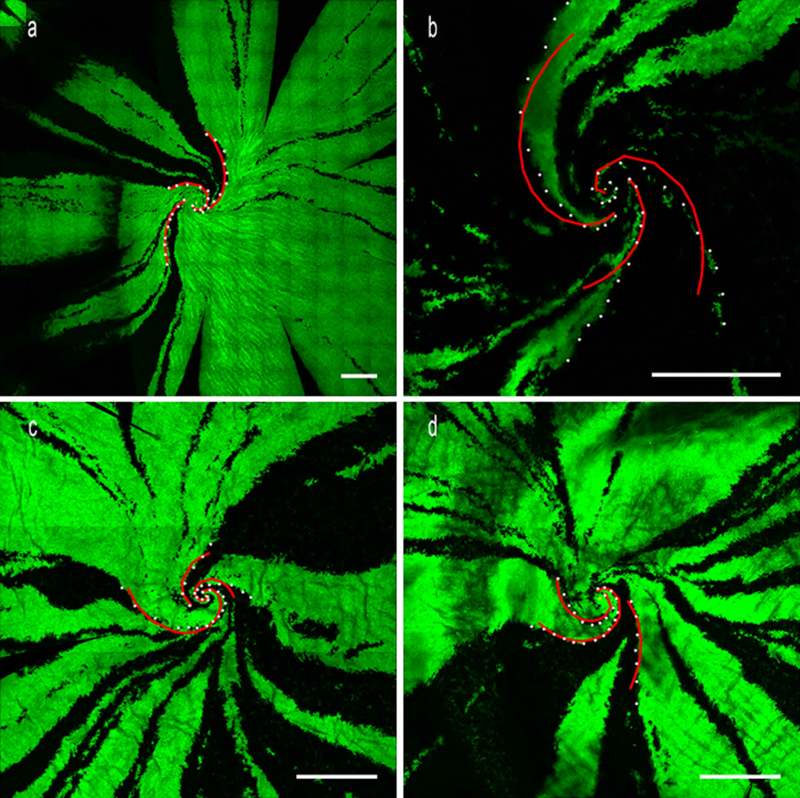 Images of the cornea from a 10-month-old rat (top left), 13-month-old rat (top right) and 16-month-old rat (bottom) illustrate spiral pattern changes as animals age. The red curves are the logarithmic spirals. As some mammals mature, cells in the cornea’s epithelium tend to develop patterns such as spirals. Learning how these spirals form and determining their function can help to understand how the human eye develops and give insight into some of the diseases affecting corneal development. 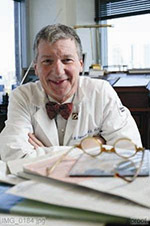 Philip Iannaccone, MD, PhD, George M. Eisenberg Professor of Pediatrics, proposed a framework for explaining the development of the spiral pattern on the cornea in a recently published paper in Biomechanics and Modeling in Mechanobiology. The research was also published in the journal Complexity. “In disease states this spiral pattern is disrupted, and we want to know what elements could be causing disease,” he said. Building upon their previous research findings on the spiral patterns in rat corneas, Iannaccone’s team collaborated with the lab of C.D. Foster, PhD, at University of Illinois at Chicago to develop and implement a computational model to investigate the stresses and strains on the surface of the cornea. Using microscopy, the team marked and measured angles in the rat corneas and compared them to simulated models. They observed various elements including pressure, shape and size of the cornea. Philip Iannaccone, MD, PhD, and his lab study the development of the cornea to give insight into how disease states occur in the eye. The team discovered two prominent logarithmic curves, which suggested a potential mechanical explanation for spiral formation. They found the spirals seem to tighten over time. Their results suggest that cell growth, division, death and behavior of the cellular matrix may influence the observed patterns. In addition to disease development, Dr. Iannaccone’s research can be applied to tissue engineering. “Corneal transplants were one of the first tissue transplants and there are hundreds of thousands of patients waiting for them. With a limited supply of donors, tissue engineering could be an option. We like to think our study also adds to the conversation in a meaningful way of how the cornea tissues could be engineered,” Dr. Iannaccone said. Future inquiries may include further alterations of the physiology of the cornea and more detailed models of the cellular mechanisms. The research was funded in part by the George M. Eisenberg Foundation for Charities and by the National Institutes of Health National Eye Institute grant EY020946 and National Institute of Neurological Disorders and Stroke grant NS054850 (subcontract). The work at UIC was funded in part by the National Science Foundation.